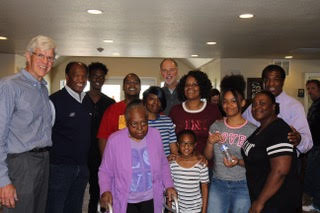 With the support of A Little Help, former NFL football players, including several former Denver Broncos, have been visiting Assisted Living and Rehabilitation facilities. We are finding a fun new way to bring some joy to the elders in our community. We have learned that a multigenerational gathering of assisted living residents and staff, as well as their friends, adult children and grandchildren offers a unique experience for all. If you are an Assisted Living facility and interested in having a small group of former NFL players (Broncos player when available) come to your facility, we will work with you to present a wonderful experience for your residents and their loved ones. We will do a site visit and talk with you about the terms of engagement and set a future date for our visit to your facility. Please contact Amanda Gregg with A Little Help at 720-220-6079.
or email Amanda at Amanda@ALittleHelp.